It has so often happened in the history of Polish culture that the invaluable service dedicated to it has been given by foreigners who had become Poles by choice. These people lived and worked in Poland without any regard for their roots, often butchering the language (it would have been far easier to speak in their own native tongues). The stormy course of Polish history, as well as maybe some qualities that are hard to define of this land on the Vistula, successfully draws astute and perceptive people from around the world (and continues to do so to this day): and so they come and offer up their talent for the good of the country. In the history of Polish music many composers have hailed from this group, and the fact that they became submersed into the national musical canon does not just mean that they have a chapter dedicated to them in Polish music history books: they are also party to the reality that there have been no efforts to preserve their work over the course of time, and have been duly treated as equals with other native Polish composers. Many works have simply disappeared because of this neglect; many more remain on manuscript, with only a handful having been published, let alone recorded. In school classes, only surnames pass through the lips of the teacher, without any representation of the composer through his actual work. Yet something has begun to shift in this matter, an example of which is this very CD. Both of the composers in this recording decided to live and work in Poland, even though they themselves were not of native descent. Józef Elsner (1769-1854) was born in Grottkau (Grodków), Silesia, to a German family of a carpenter and instrument builder. When Elsner put on his first operas in Lemberg (Lwów), the libretti were written in German. Yet when the composer started to co-operate with Wojciech Bogusławski, he not only started to use just Polish in his works, he became so captivated by Polish folklore that he even began to make reference to it in his compositions. He is known most of all as a teacher of Fryderyk Chopin, and is the author of an impressive amount of works: over 20 operas, 24 Latin masses, 4 oratorios, 44 cantatas, and about 100 solo songs, of which the majority have never been performed, or have never been published. The second work presented in this recording, the Grand Trio Op. 4 for Piano, Clarinet and Horn, was also authored by a composer who chose Poland to be his homeland. Franciszek Lessel (1780-1838) was born to a family of a Czech musician, Wincenty. Franciszek’s first teacher was his father, not only an accomplished musician, but also a composer. When he turned 18 he left for Vienna, where he became the favourite pupil of Joseph Haydn. And so, the influences of the first great Viennese classical composer are very visible in the Grand Trio. The work does not find itself in any of the Lessel’s compositional lists, even though it was published twice: in ca. 1806 in Vienna and after 196 years, in Kraków. It has never before been recorded, so this CD contains its phonographic premiere. Even though only eight years separate the Trio from Elsner’s F major sonata, it seems as if it were light-years away in respect to musical expression. On a formal classical skeleton (sonata allegros dominate in all three movements – Allegro con spirito, Adagio espressivo, Allegro), Lessel managed to unbutton a layer of great musical emotion, full of lyricism and romance. The main instrument here is the piano, which provides a base continuo for the presentation of the clarinet and horn. The piano score contains thematic material, connects transitional sequences, as well as provides simultaneous dialogue with the remaining instruments. It seems that the constructed harmony, especially in the second movement, goes further than its contemporary function dictated, and is treated partly colouristically. Although the Trio comes from the first stage of Lessel’s compositional career, one can boldly say that there is a palpable air of approaching Romanticism throughout the work. In this respect it is very definite that he overtook Elsner, who was 11 years his senior. Not in vain, however, as the former was all too familiar with the talent of his younger colleague, and wrote in his Music Lexicon of Lessel’s compositions as being ‘genius‘: only the work of Chopin also achieved such high appraisal. Indeed, when one hears the music of Franciszek Lessel, especially his works for piano, the base upon which the great Chopin’s masterpieces were built become all too clear. 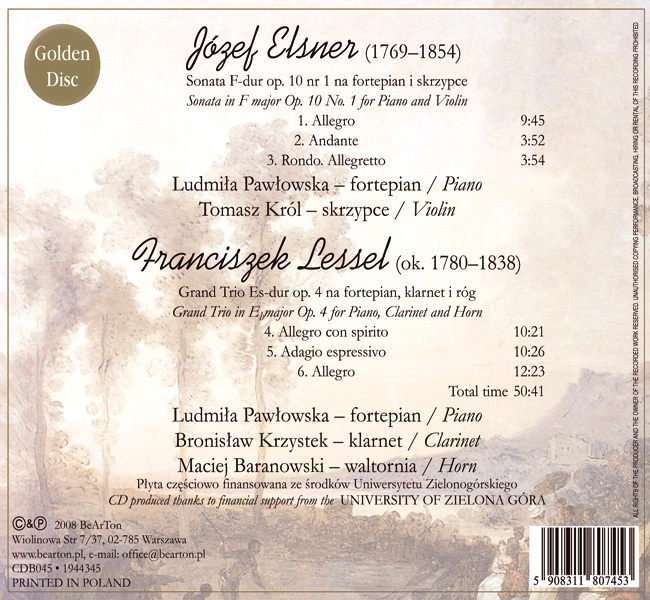 Let us hope that this CD kindles other performers to become interested in Polish music before the Chopin era, which still hides many valuable works. 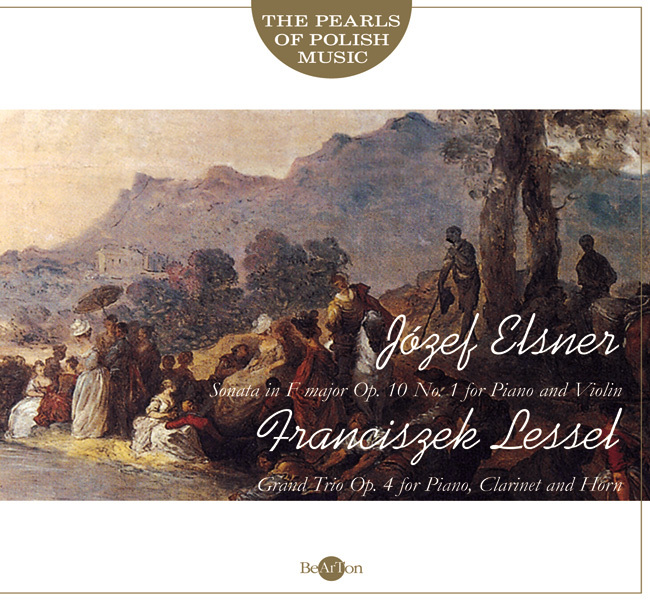 If Józef Elsner and Franciszek Lessel had not chosen to live in Poland but the countries whence their families came, their works by now would have surely been recognised across the globe.